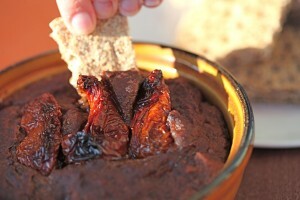 Anyway, I was singing this song (as is my wont) when I made this Vegan Black Bean and Sun Dried Tomato Dip. The combination of black beans and sun dried tomatoes makes it a sunny sort of food with something of a Mexican feel to it. You can serve it as a warm dip (delicious) or let it cool and use it as a pate (equally tasty). This dish is low fat but high flavour and has a good balance of protein and carbs. It also has a healthy dose of potassium to help build proteins and muscle and break down carbohydrates. Ideal runners’ food then! It’s easy to make, of course. Just buzz it all up in a blender (I used my fabulous Froothie), bake it and serve (full details below). Set aside 2-3 sun dried tomatoes then put all of the other ingredients in a blender. Place in an ovenproof dish and garnish with the saved sun dried tomatoes. Serve warm as a dip or allow to cool and use as a pate. It's delicious either way! I’ll be making this tonight, looks great. What’s the nutritional yeast for, is it optional? I like all your article. You put really very helpful information. Each & every tip of your post is awesome. I want to say thank you. Good job!